No one wants to feed a body something he will, for whatever reason, find disagreeable. Often people on a guest list will let you know of their own accord if they don’t eat certain types of food. There are also individual foods that fall under the category of specialty tastes. What goes on this list is a matter of opinion. Both snails and raclette are very fine, but I wouldn’t surprise someone with their first experience of either. Having accepted these parameters for planning a menu, people, as a rule, like to try different things. Innovations are frowned upon at holiday dinners when everyone wants to see familiar traditions on the table. But at other times, departures from the tried-and-true are generally welcome. It seems to me that giving people something new to eat primarily means thinking of what they might enjoy for the first time–something that doesn’t require developing a taste for it. It ought to be, like a ride on a ferris wheel, a genial diversion, not a jarring spectacle or display. Sonoran Roast Pork is on the order of the ferris wheel experience. The flavour combinations will be new to some. Still, the dish is very accessible and not at all difficult to appreciate. 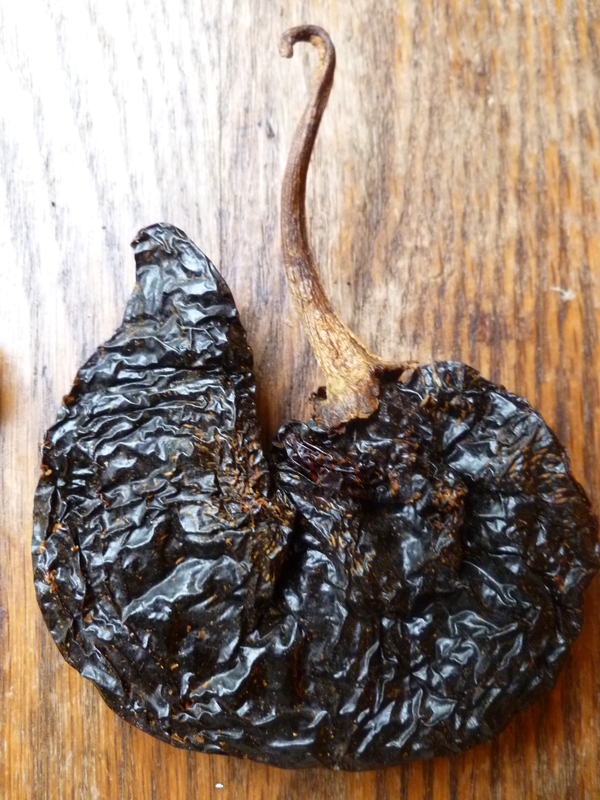 ‘Pasilla’ means ‘little raisin’ and the chili’s black, wrinkly skin accounts for the name. Even though the chili in the photo isn’t a true Pasilla, its appearance suits the description, too. 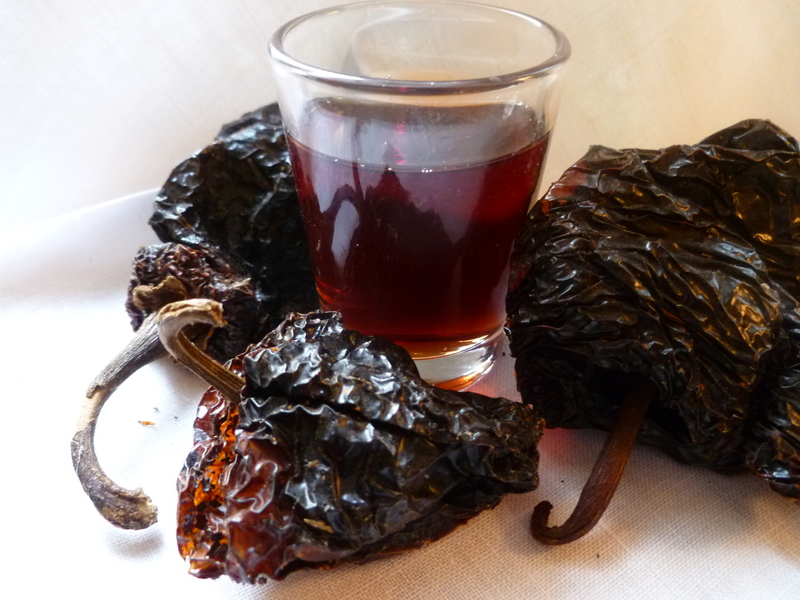 A true Pasilla is the dried form of the long, narrow Chilaca pepper. But in the United States, fat Ancho chilis (which are the dried form of Poblano peppers) are also called Pasillas. 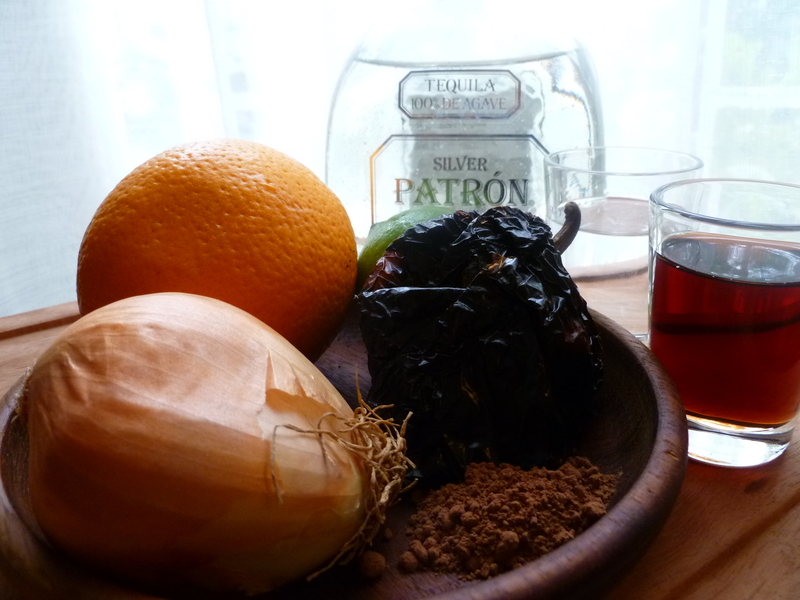 For the photographed roast, ‘so-called Pasilla chilis’ were used and they do very well if you can’t obtain the real Pasilla. Demi-glace is a thick, concentrated brown sauce made from a reduction of beef stock and Sauce Espagnol (another brown sauce). Making it is a project that can be fun under the right conditions–the main ones being inclination and a free afternoon. 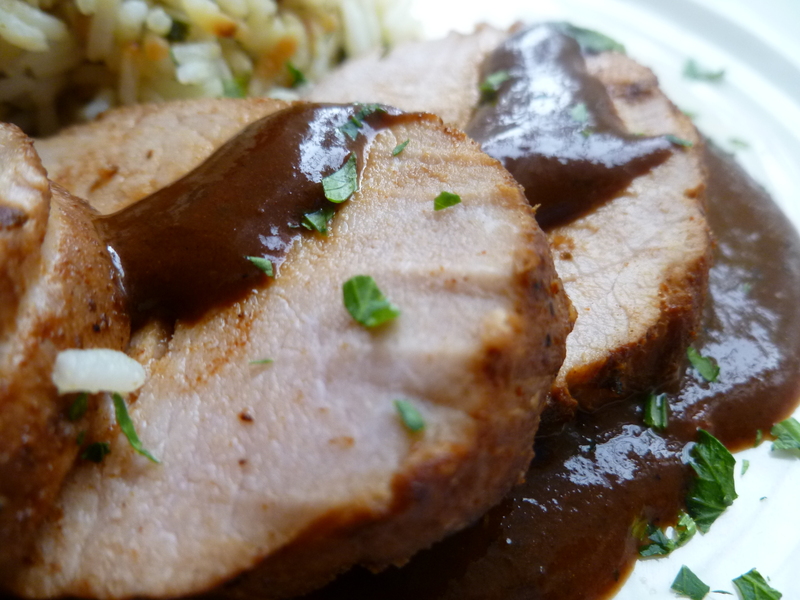 The website ochef provides good instruction on how to make your own homemade demi-glace. 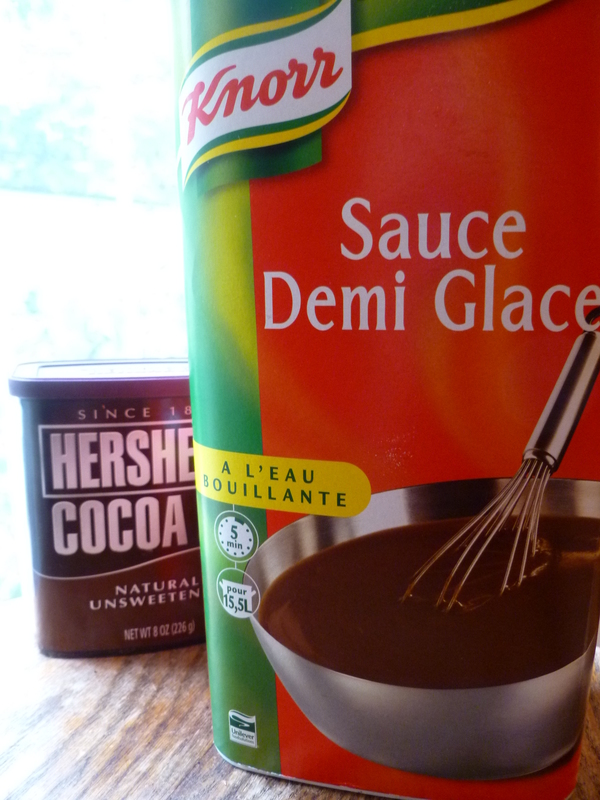 Another alternative is to buy demi-glace. Knorr sells both liquid and dehydrated forms. I have used both and recommend both. Recipes generally call for small amounts of demi-glace. One can make a large amount from the powder, freeze it in ice cube trays and store the frozen cubes in a bag, thawing what you need for a recipe. A large box of the liquid form may also be frozen in cubes. The pre-packaged sauce is nice to have on hand, so that, when an interesting-looking recipe calls for demi-glace, you need’nt be dissuaded by the time it will take to make it. Grenadine is a syrup made of sugar and any red fruits, such as currants, pomegranates, cherries or raspberries. Some store brands are made of only corn syrup and food coloring. 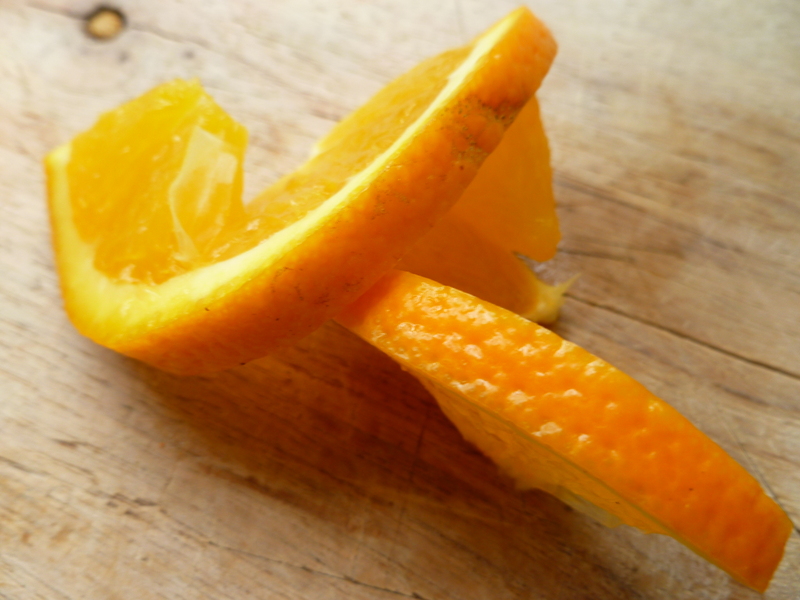 Others do contain fruit, and one of these was used for the marinade and sauce in the photos. Another option is to make your own. Cupcakeproject offers a simple recipe. 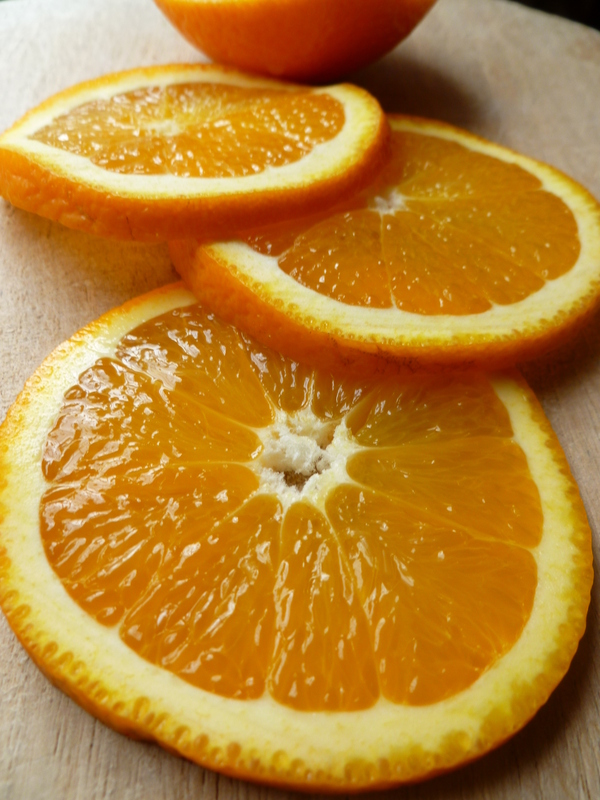 2 cups of fresh orange juice: if you are making the Fresh Corn and Black Beans that accompany the roast in the lunch menu, Southwestern Elegance, you may want to cut 5 of the oranges in half, hollow them out before pressing the juice from the flesh, and serve the corn in the reserved shell halves. 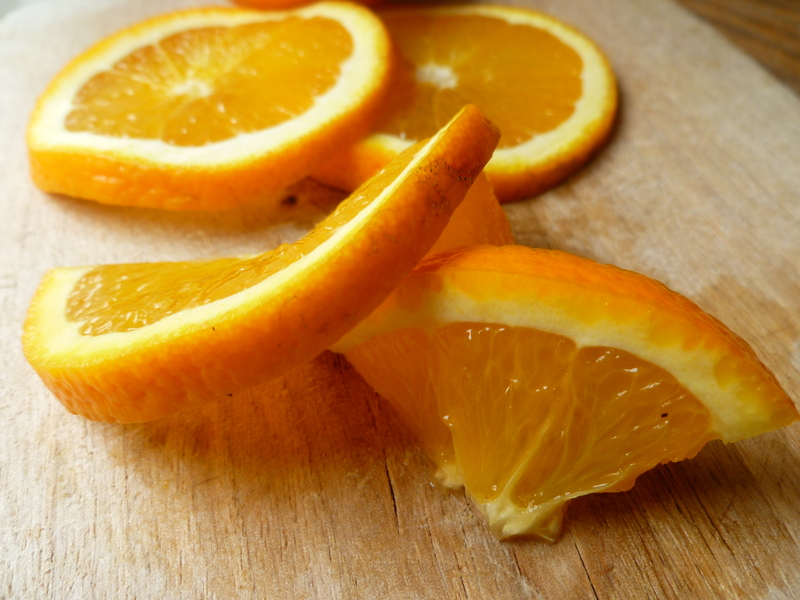 One can only estimate how many oranges will be needed for 2 cups of juice: 10 or 12 will probably be enough and if there is leftover juice, it may be frozen, like demi-glace, in ice cube trays and stored for some other use. 1. Toast the chilis in a dry pan until they begin to smell like…toasting chilis. This will take about a minute. Place the chilis in a bowl, cover them with boiling water and place something on top of them to weight them down so that they soak covered in the water. Soften them in this way for about 30 minutes. 2. Tear the stems from the chilis, seed them and put them in the blender or processor. Add the orange and lime juices and blend them well with the chilis. Add the grenadine, tequila, salt and thyme and blend again. 4. An hour or so before roasting the pork, take it out of the refrigerator to come to room temperature. Preheat the oven to 350 F. Transfer the pork to a plate while you run the marinade through a sieve into a bowl. Brown the pork in the olive oil, either in the Dutch oven or casserole (if it is big enough) or in a pan. Add the sieved marinade to the casserole in which you are going to roast the pork, along with the pork, if you have browned it in another pan. 5. Roast the pork uncovered for about 15 minutes per pound. Spoon sauce over it occasionally while it is in the oven. The 3 and 1/2 pound pork loin in the photos roasted for 1 hour and 15 minutes. 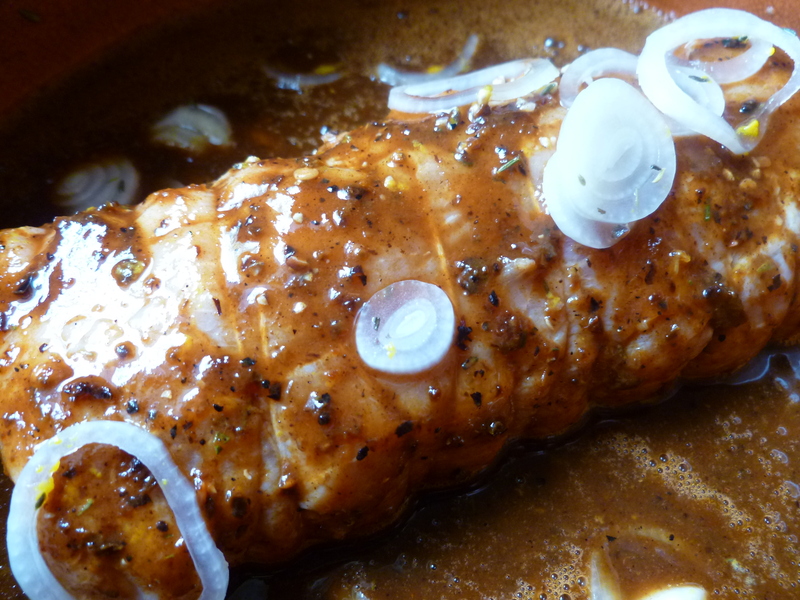 Remove the pork from the marinade and let it sit, lightly covered, while you make the sauce. 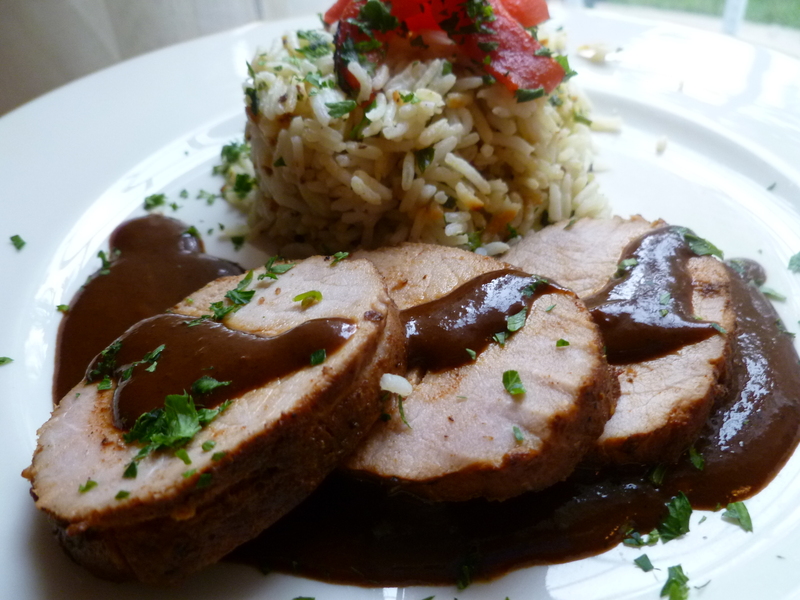 A suggestion for serving the pork is to pour a little sauce in the middle of each plate, place several slices of roast on top of the sauce, and a little more sauce over the pork. 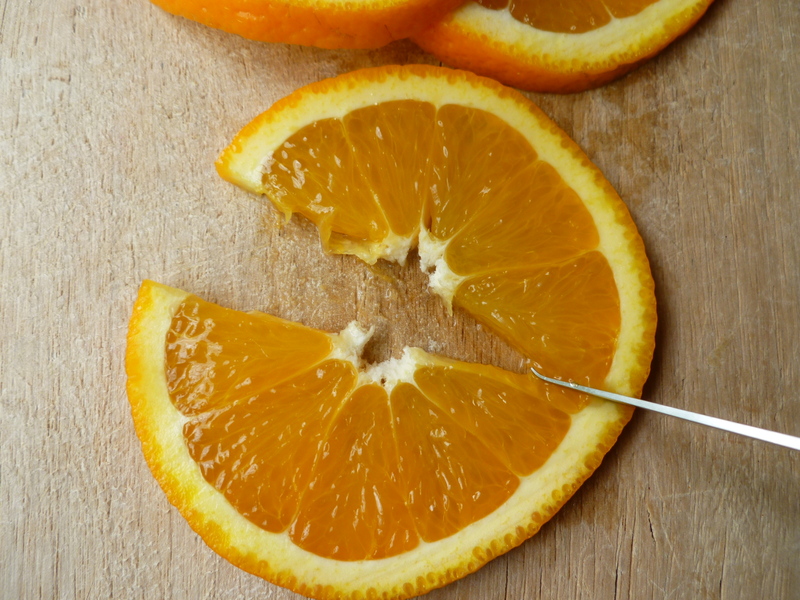 One possibility for a garnish is a Twisted Orange Slice, which is described below. 1. Bring the marinade to a boil and whisk in the demi-glace. 2. When it is well combined, whisk in the cocoa powder. Allow the sauce to boil for a minute or two to reduce and thicken it. Add a little more cocoa if you would like to thicken the sauce more–but this probably won’t be necessary. A Note: Sonoran Roast Pork with Chili Pasilla and Fresh Orange Sauce is the Main Course in the Lunch Menu: Southwestern Elegance. 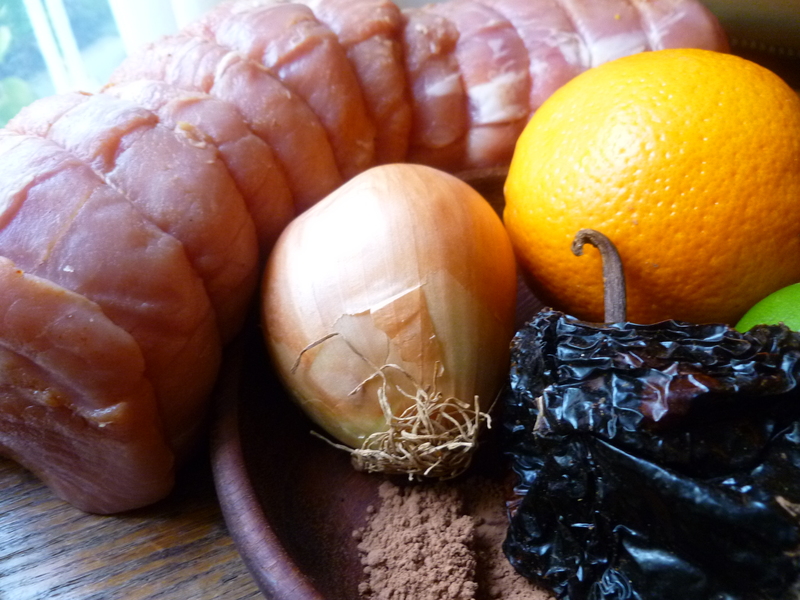 James Peyton’s website, LoMexicano, is the source of the Roast Pork and marinade recipes. The sauce, based on LoMexicano’s marinade, is my addition. Guests seem to really enjoy it, Holly.